Last weekend on our “discover Cape Town” trip, we decided to check out the coastal fishing village of Kalk Bay. 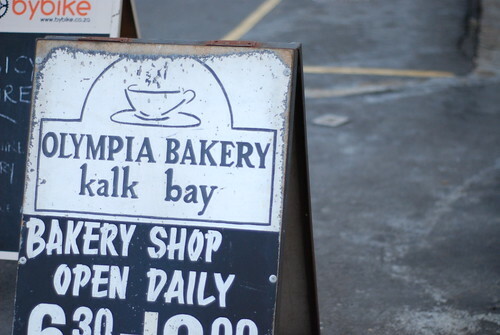 I had two main intentions, eating fish and chips at Kalkies and checking out the infamous (at least on this side of the World) the Olympia Bakery & Cafe. So after my fish and chips, it was down to the main road in Kalk Bay to look for this cafe, which was quite easy to find and almost a strong stone throw away from the fishing port. Olympia is very popular with the locals are supposed to be famous for breakfast and apparently on Saturday mornings, it can be near impossible to get a seat inside if you are a late bird. Lucky for us, we popped in during the late afternoon, where the mood was lively and very down to earth. 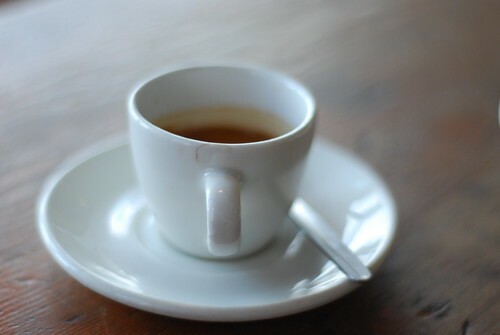 True to form, I ordered a double espresso – what else in the afternoon ? 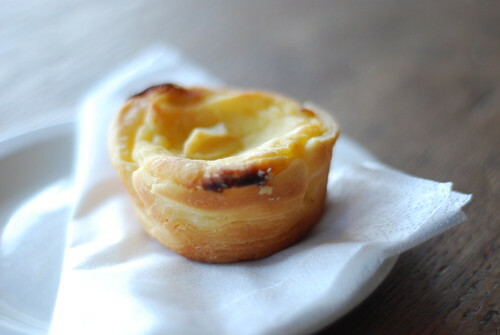 Being a bit of a sweet tooth, I noticed that most of the pastries and cakes were gone – good for Olympia as they got to sell their stuff, but spotting the no-serious-cafe-in cape town-cannot stock pasties de nata phenomenon, I went for one Pasties de Nata to accompany my order of a double espresso. I must admit the pasties was more cake than pasties & custard, but fine for me. My daughter was with me and so not to be left out, we ordered a hot chocolate too, which she took away, enjoyed and spilt in the car, hmmm. The coffee at Olympia is supplied by Origin Coffee Roasting, based in de Waterkant, which you can find more about on my blog roll and if you do visit Cape Town and rent a car, (you will need to for this trip), then I recommend the 30 minute drive from the centre of Cape Town to this village, which apparently is very busy during the high tourist season between mid-December and mid-January, because of its quaint appeal and warm beaches, not to mention Seal watching, fish restaurants and of course Olympia Bakery. This entry was posted on Tuesday, March 23rd, 2010 at 4:59 pm	and tagged with Bean There - Cafes, Cape Town, espresso, Kalk Bay, Olympia Bakery and posted in Uncategorized. You can follow any responses to this entry through the RSS 2.0 feed.